The New York Islanders were hosting the San Jose Sharks in their second game of the 2018-19 regular season on Monday, which also was their third game of the campaign. This sure has been a new chapter for the Isles, who lost the services of their former captain and star player John Tavares, who ended up signing a lucrative seven-year contract with the Toronto Maple Leafs. Since then, Anders Lee has taken over as captain, and the Islanders are looking ahead with new head coach Barry Trotz behind the bench. New York managed to impress fans as they down the Sharks, and new star blue liner Erik Karlsson, 4-0 on Monday afternoon. They also managed to win their first game of the season against the Carolina Hurricanes, hoping to kick off the season on the right foot. You can see the game recap in the video above. 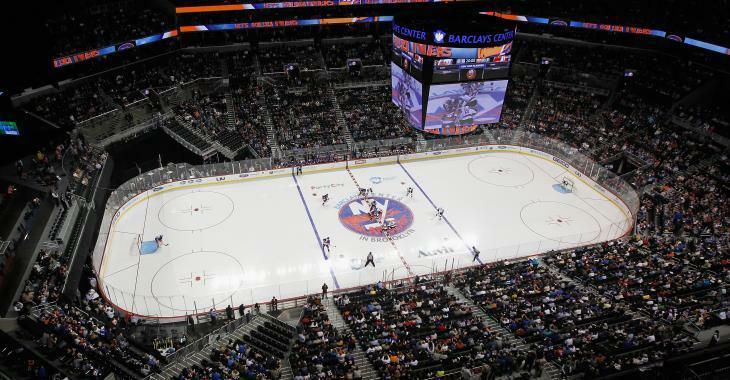 Far from it… the Islanders did not impress MANY fans as they set a new low in attendance for regular season game at Barclays Center. The total of people present were a tiny 8,790 fans, the lowest since the team moved there, according to team insider Arthur Staples for The Athletic. Of course, fans may still be upset over the loss of Tavares, however, they have to admit that the addition of Trotz and a few promising free agents during the summer are exciting news moving forward in Brooklyn. Robin Lehner managed to record his first shutout of the season, and the Isles offered a clear win against one team that loaded up of the blue line during the offseason. Let's hope that Islanders fans in Brooklyn notice the success in the early part of the season and will decide to go to the arena to encourage the Isles throughout the year.